Coveside Bank - Wellesley Conservation Council, Inc.
Coveside Bank Sanctuary is located between #9 and #17 Stonecleve Road. It was a gift of the Pine Ridge Neighborhood Association in 1963. The neighborhood group wished to preserve a narrow strip on the bank leading to Morses Pond to provide youngsters with public access to the cove where they could fish and launch their rafts. The Council made this possible by accepting their donations and using the money to purchase this property. The bank leading to Morse's Pond is very steep. A set of stone steps has been installed to allow a closer approach to the pond. 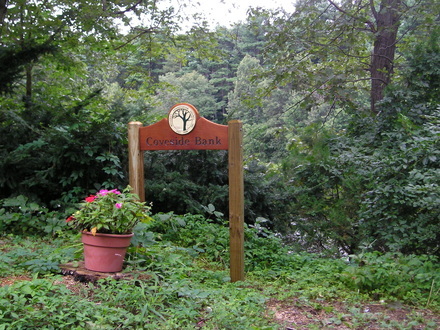 For directions to Coveside Bank Sanctuary click here.